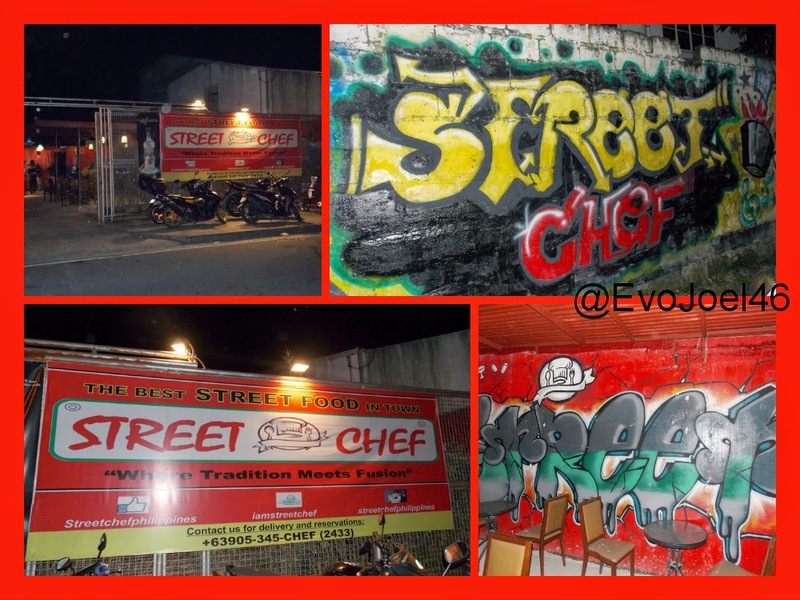 Evo & Grace: The WanderLusts: Street food with fusion @ Street Chef. Situated at the heart of sprawling Mandaluyong City, is Street Chef, a more than year old restaurant that give venues for food expert without formal training or background in Culinary, however they maintain the quality and the taste it require. One of its owner told us that July 2013 when they began operating this 80 to 100 seating capacity resto bar, with an advocacy of promoting cooks that didn’t undergo school for cooking, but the talent and skills in food preparation is enormous and beyond, and from that, Street Chef enrolled them to TESDA to formalize their careers. From the usual street foods of Pinoy, Street Chef draw their specialty out of it and present it with distinctly unique look and taste, yes we are talking about the Balut, Betamax, Isaw and chicken feet (Adidas) serve in a platter with unique sauce and some ala-gourmet drama. Like the Sizzling Balut, the fusion rely on the sauce that create a way for you not to think that its Balut that was serve, it’s one of Street Chef most ordered, since it has a unique and must try for everyone like foreigners who want try local delicacy. Beef with Mushroom is another good try, rich in taste but creamy in nature. Tochong Bangus is highly recommended, its crispiness with tomato blend is so good, I was inform that Tocho is a local product in Mandaluyong, and they recreate that ala-five star hotel serving. Other Street Chef specialties are Nilagpang, Pinaupong Manok, Adobong Pusit, Dinuguan sa kawali, Adobo sa Puti and the sizzling plates of variety street foods. For Dessert, Leche De Mango is a winner to remove all the after taste, with real mango join by Leche Flan and creams, perfect to end great dinner. The venue itself is a work in progress, it’s a perfect hideaway for some group or couple who want to ease the tension of the day, with some artworks signage on its walls, and it still looks private with some plants covering some spaces. If there is food there is drinks, and one of its runaway winner is their house tea, a special blended ice tea with secret formula. And since it’s a bar, cocktails is on the list as well, Gabriela is a must for long hard nights fun, it’s a Vodka, rhum and others to cool the evening conversation. They also serve Pink Street Champagne and highly chilled beers. Street Chef is open daily from 5 in the afternoon till 3 in the morning, they also accept reservation for special occasions, and for every Monday, Wednesday and Friday a Disc jockey dominates their air, while Tuesday, Thursday and Saturday is for acoustic session. They also accept food delivery under City Delivery Tel Nos. 2121212. 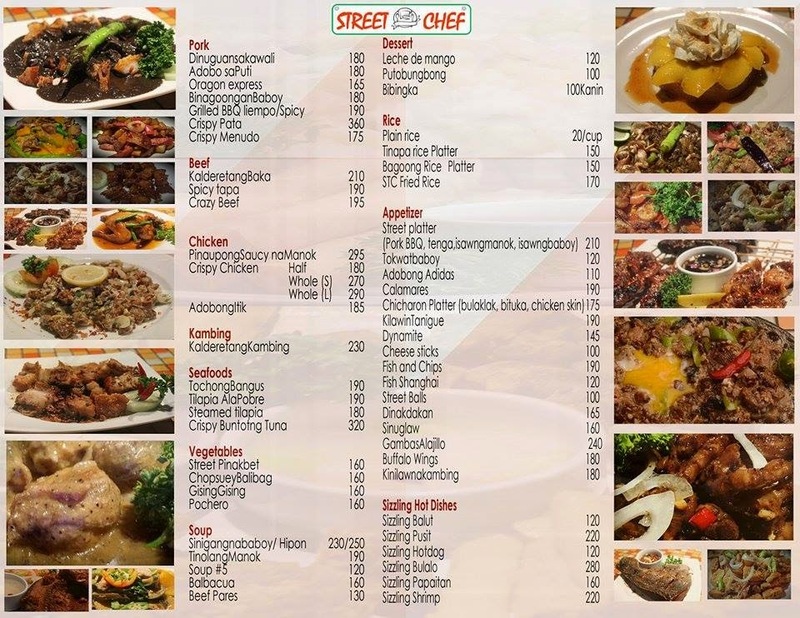 Street chef is located at 880 San Rafael Corner Martinez Street,Plainview, Mandaluyong City. Street Chef Menu as of December 2014.